PRICE: It was about $15 when it was new in 1986. Compared to the F-8 Crusader fighter, the A-7 had a shorter, broader fuselage. The wing was made larger, and the unique variable incidence wing of the F-8 was deleted. To achieve the required range, A-7 was powered by a Pratt & Whitney TF30-P-6 turbofan producing 11,345 lbf (50.5 kN) of thrust, the same innovative combat turbofan produced for the F-111, but without the afterburner needed for supersonic speeds. Turbofans achieve more efficiency by moving unburned air at a lower velocity. Fujimi has a rather checkered history when it comes to its model kits. They are either superb or they are really bad when it comes to fit. Thanks to the previous importer (MRC), they were also priced so high that they sat on shelves for years. Just shows that greed does curtail sales. The Fujimi A-7 series is, in the opinion of most, the finest 1/72 Corsair II kits done. They have superbly done, crisp engraved detailing and super thin clear bits. So thin that your editor has broken more windscreens than he'd care to admit. Thanks to non-existent customer service from the importer, none of those parts were ever replaced and I had to make do with the broken bits. 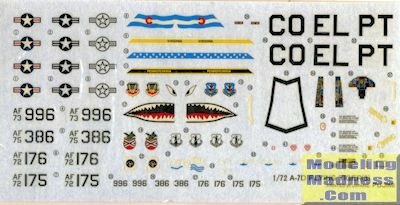 1/72 cockpits are rarely super detailed and Fujimi does provide decals for the instrument panel and side consoles, but those items are also nicely detailed with dial faces and such so you may want to consider paint and dry brushing. A well molded, but rather bare seat is provided along with a nice control stick to round out the cockpit. There is room in the nose for weight and the wise will put some in there just to be sure. As this fuselage is the basis for a number of variants, the intake is separate and the most difficult part to do well. there is a rather good intake trunk, but there is also a seam that runs right down the middle of it, making filling prior to installation a must. Same with the upper section. No compressor face is provided. Wings can only be displayed extended and the flaps are integral with the wings. Inner pylon holes are pre-drilled, which is fine as the Corsair II was rarely seen without wing pylons. The kit has a separate sprue that is only for the USAF version that includes the proper wheels, dorsal refueling receptacle, nose gear and other land-lubber pieces. Wheel wells are nicely detailed as are the landing gear. One thing about Fujimi A-7s is that they come with racks and weapons. For the A-7D, you have a pair of MERs, a pair of TERs and a pair of wing tanks. Snakeyes are provided for the bomb racks, though it is a rather light load. Sidewinders and rails are also provided. Instructions are well done with Gunze paint references. Unfortunately, the bulk of hints are in Japanese and the minimal English translations are, well, a bit funny in some cases. There are four markings options, all in a wraparound scheme. The first one is with the 74 TFS/23 TFW with a nice shark mouth and full color insignia. Next is a 120 TFS Colorado ANG plane with low visibility insignia. This aircraft and the 74 TFS plane are in an SEA wraparound camo. In a similar scheme to the Colorado plane is a Virginia ANG plane with the 192 TFG. The fourth option is a 146 TFS, Pennsylvania ANG plane in the later dark green/dark grey wraparound scheme. All the ANG planes have the Pave Penny pod. The decal sheet is nicely printed and includes instrument panel and side console markings. I've built several of these kits and can tell you that they build well, though are not slammers. Care needs to be taken during construction and the parts all test fitted before gluing. I note that some of these are now becoming available again after a rather long absence from the shelves and you can still find them at swap meets for reasonable prices. Way back when, Testors reboxed some of these and those are well worth seeking if for no other reason than their superior decal sheet.